El Paso's labor-intensive growth of the last two decades can be seen as a microcosm of recent decades' trends in the larger U.S. economy: retention of marginal industries, preference for inputs of labor over capital, high immigration, and "de-skilling" of much of the work force. Breaking the cycle will be difficult. The heavily Hispanic border environment slows the transition to English and impedes assimilation. Their continuous influx into the under-financed public schools isolates English-deficient Mexicans and Mexican-Americans, precluding rapid acculturation and quality education. Mexico's exploding labor force will continue to leak into U.S. border labor markets. El Paso must improve education and job training skills and work to attract higher value-added industries. Meanwhile, the city and region must do what it can to slow the increase in low-skill workers and press Washington for better enforcement at the border and against employers of ineligible aliens. Otherwise, with tight budgets slowing the growth of government employment, and free trade portending intense Mexican competition with El Paso's manufacturing, retail and wholesale sectors, the city can expect creeping double digit unemployment and decline to third world standards as permanent features. El Paso, Texas, and its suburbs comprise one of America's poorest urban areas by a number of measures. El Paso's 1989 per capita personal income of $9,150 ranked lowest among the nation's 75 larges cities, and 36.5 percent below the national per capita income of $14,420. Median family income in 1989 was $24,075, 68.3 percent of the national average. Since the mid-1970s, unemployment in El Paso County has ranged between 1.5 percentage points and 4 percentage points higher than the U.S. average. In 1992 El Paso had unemployment of 10.7 percent, compared to 7.5 percent of the then recession-struck United States. Not only are general earnings lower, but income in El Paso tends to be more unevenly distributed than in the United States as a whole (Peach, 1985, 73). These lagging economic and social indicators, however, seem surprising in light of El Paso's success in matching or exceeding the robust growth of most Sunbelt cities since the 1960s. The city's population growth and job creation have exceeded national averages. El Paso has attracted an array of new industries, though few of them involving high value-added production. In the decade of the 1980s El Paso County's employment grew by a 2.9 percent annual average, compared to a 1.7 percent average for Texas and a 1.6 percent average for the United States. Yet El Paso has continued to suffer markedly higher unemployment and persistently lower earnings than Texas and the nation as a whole. This study examines the El Paso Metropolitan Statistical Area's (MSA) paradox of vigorous, though sporadic, job growth on one hand, and its persistent poverty and unemployment on the other. A main line of inquiry is the nature and quality of El Paso's economic growth since the 1960s in light of the composition and growth of its labor force, the city's location adjacent to Mexico, and key demographic and migration trends. Geography was a key factor in determining El Paso's foundation, just as it remains important in the city's contemporary economy. The town of "Paso del Norte" was founded as a supply center in 1659 by Spanish Conquistadors where the Rio Grande crosses the Chihuahua trail, an historic trade route between central Mexico and Santa Fe. El Paso became an American border city in 1848 when Mexico ceded it, along with vast surrounding territories north of the Rio Grande, to the United States. The town remained a sleepy village until the early 1880s, when the arrival of four American and one Mexican railroad turned the town virtually overnight into a transportation and supply center for the southwest and a gateway into Mexico. With its location at the hub of a rail network, the city rapidly attracted other industries and services, such as agricultural supply, smelting and other mining support services (Garcia, 1981, 11-18). El Paso's early major occupations, such as smelting and railroad maintenance, depended heavily on cheap labor — a dependence that still marks the city's culture and economy. Early on, El Paso and the surrounding region emerged as a major usage and distribution point for low-wage, docile workers from Mexico. The Mexican rail connection with El Paso made possible a profuse flow of migrant workers from populous central Mexico. And the galloping development of the Southwest during the last two decades of the 19th century fueled demand for cheap workers for rails, irrigation, construction and agriculture. Labor contracting became an important service industry for El Paso during this period (Garcia, 1981, 51-58). El Paso's main appeal to business interests as a pool of cheap labor persists to this day. Growth in the region surged again during World War II. El Paso County's population grew by 49 percent in the 1940s and by 61 percent during the 1950s. Since 1960, the area has grown by an additional 89 percent. In contrast, the U.S. population grew 15.2 percent in the 1940s and 18.7 percent in the 1950s, and has grown 72.7 percent since 1960. 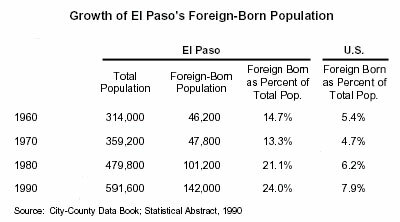 The 1990 census found the population of El Paso County (which is coterminous with the El Paso MSA) to be 591,610; 69.5 percent Hispanic and 24 percent foreign born. The labor force of El Paso has grown even more rapidly since 1960, as Table 1 shows, with employment growing at twice the national rate. Which sectors of El Paso's economy have created so many jobs during the past three decades? Why? And what does it tell us about the composition and deployment of the region's labor force? In the private sector, El Paso's growth has bucked national trends to a remarkable degree, particularly in manufacturing. Manufacturing employment increased by 162 percent between 1962 and 1989 in El Paso. But manufacturing jobs in the United States as a whole, slowed by foreign competition and rising productivity, peaked in 1979 at about 21 million workers and have since been in gradual decline. In 1989 U.S. manufacturing employment was 7.6 percent lower than its 1979 peak, and only 20 percent larger than in 1962. 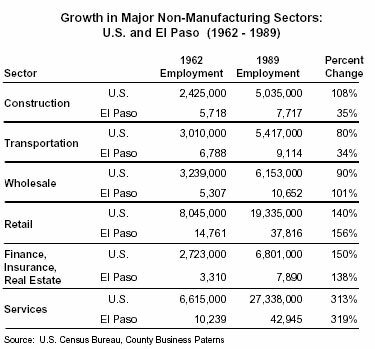 In comparison, manufacturing occupied nearly 26 percent of El Paso's non-government employment in 1988, though the sector has since shown some shrinkage because of declining demand in 1989 and 1990. El Paso's manufacturing has also countered national trends with the substantial growth of investment in what elsewhere are declining industries. These industries usually are labor-intensive, low valued-added industries such as apparel, food processing, smelting, and leather, many of which are now among the city's basic industries (see Table 2). Much of El Paso's growth has come from the decentralization of industries in the former U.S. heartland to peripheral areas in search of cheaper and more abundant labor and an absence of labor unions (Suarez-Villa, 1985, 40-43; Hansen, 1985, 6). Another attraction for some light manufacturers has been El Paso's proximity to Mexico and the prospect of profitable connections with Mexico's maquiladora program. (Maquiladoras, also known as "in-bond" industries or "twin plants," are Mexican plants that perform labor-intensive processes on U.S.-made products and re-export those products to the United States, with customs payable only on the value added.) 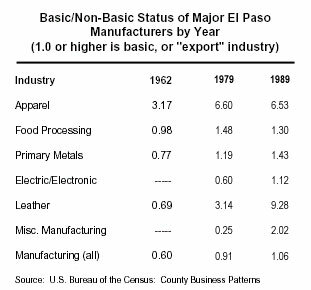 Table 2 describes the emergence and growth of El Paso's current "basic" industries, which are those industries that "export" their production to the rest of the United States, thus earning "new money" for the city. An industry is basic if its share of total employment in a given city equals or exceeds that industry's share of total employment nationally. Thus, a value of 1.0 or more indicates a basic or "export" industry. The apparel industry, a major employer in the El Paso private sector for more than four decades, continued rapid growth in the city through the 1980s. Meanwhile, apparel's share of U.S. employment has plummeted, first as a share of total employment and, more recently, in absolute numbers. Between 1962 and 1989 apparel industry employment in El Paso grew by 202 percent, while shrinking nationally by 14.4 percent. In an even more extreme case, employment in the national leather industry has declined by two-thirds since 1962. But, in the same period, it has grown by 247 percent in El Paso. Employment in primary metals (copper and lead smelting, a traditional El Paso industry) was near stagnant between 1962 and 1989, increasing by only 13.8 percent, or 0.5 percent a year. But the industry in the El Paso MSA remained solidly "basic" just by holding its own, while primary metals employment shrank nationally by 36 percent. Electric/electronic manufacturing became a basic industry in El Paso in the 1980s because of the decision of one major firm, Rockwell International, to establish a circuit board production center in the County employing some 1,200 to 1,500 workers (El Paso Employers, 1990). 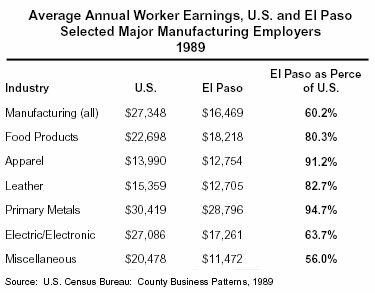 El Paso's industrial sector thus remains dominated by low wage industries. The wages those industries pay in El Paso are themselves markedly lower than those prevailing in the same industries elsewhere. Consider the comparison, in Table 3, of average earnings of payroll employees for 1989 in El Paso and the United States, based on County Business Patterns (1989). El Paso's industrial earnings have also regularly been lower than state averages for other Texas cities, with few indications that the gap is narrowing. Note Table 4 drawn from Bureau of Labor Statistics data (Employment and Earnings). While much of the rest of Texas has moved toward higher value-added industries and services, El Paso's industrial growth remains tied to low-wage processes in labor-intensive industries. In the case of the medium to higher wage industries that the city has attracted, such as electronics, the El Paso operations appear to be the lower value-added processes of those industries, with possibly some "de-skilling" of the jobs brought to the area. A glance at value-added and investment data for El Paso, other Texas cities, and key manufacturing cities elsewhere underscores the area's low productivity industrial profile. The linkage between El Paso's industrial sector and the maquiladora industries in nearby Ciudad Juarez, long foreseen by local businessmen and free trade proponents, remains in its nascent stage. The El Paso Chamber of Commerce estimated in a 1991 publication that 9000 jobs in El Paso's private sector (5.8 percent) directly result from the maquiladoras (El Paso Business, 1991). But meanwhile, much of El Paso's own industrial sector has taken on the appearances of a "domestic maquiladora" within the U.S. economy, providing labor-intensive processes that much of the rest of the nation has left behind. Even with the boom in manufacturing employment, the bulk of El Paso's job growth since the 1960s has been, as elsewhere in the United States, in wholesale, retail, services and government. Table 6 shows a comparison between the United States and El Paso in the percentages of growth in non-manufacturing employment between 1962 and 1989. Employment in health services in El Paso has grown by 455 percent since 1962. While the expansion has been faster than the national average of 411 percent, El Paso's health sector had farther to go. Health service still is not a "basic" industry. Federal, state and local civilian employment have also shown marked growth in El Paso, rising from 26,400 in 1975 to 45,300 in 1989, an increase of 71.5 percent. The growth of government jobs comes in part because of the rising law enforcement and administrative demands of border management and in part because the social and economic problems of the area's growing low-income population have required increased services from federal, state and local public assistance agencies (Hansen, 1981, 74). Ten percent of El Paso's households received public assistance in 1990, one-third higher than the national average. Thus El Paso's economy can boast the addition of at least 83,000 non-industrial jobs since 1962. While it has been a satisfactory performance considering the economy's inherent anemia, it has not been nearly enough to the bring the region's unemployment down nearer to the national average. Indeed, some trends in the city's non-industrial growth have added to the depressing effect on the region's average earnings, reinforcing El Paso's status as a low wage town. The retail sector in El Paso is a "basic" industry with a score of 1.16 in 1989. With 37,800 employees, it ranked second only to services as a source of jobs in the city. The retail sector, however, has too many structural weaknesses to offer much promise for raising the community's average income. Retail employment in El Paso has boomed primarily because of the merchants' role as purveyors to rising numbers of shoppers from south of the border. Trans-border demand also fuels El Paso's wholesale sector. Juarez's population has spiraled from 407,000 in 1970, then comparable to El Paso's, to 1.2 million in 1990 — twice the size of El Paso's (El Paso Chamber, 1991). Mexico's inefficient consumer goods producers and marketers have made U.S. border cities such as El Paso havens for middle class Mexican shoppers. While Mexico has resumed economic growth after stagnating from 1982 to 1990, the average effective demand of even middle class Mexican consumers remains modest by U.S. standards. The El Paso retail sector's heavy dependence on Mexican shoppers has disadvantages: it led to mini-recessions in the city in 1976 and 1983 when major devaluations of the peso made American products prohibitive for Mexicans. Mexico's financial collapse in 1982 triggered a 4.4 percent decline in employment in El Paso in 1983. The current Mexican administration of President Salinas de Gortari has opened the economy to U.S. products and is actively pursuing a North American Free Trade Agreement with the United States and Canada. But totally free trade in U.S. consumer products would probably hurt, not help, El Paso retailers and wholesalers, as it would enable Mexican merchants to offer a full range of inexpensive U.S. goods at home and spare their customers a trip north of the border. Besides its over-dependence on Mexico, the retail sector is characterized by extremely low earnings. The profusion of establishments includes hundreds of small, family businesses. More than 2,800 retail employers filed wage reports in 1989. Average hourly earnings in retail in the United States, $6.76 an hour in 1990, were the lowest of any national sector. In El Paso, retail earnings are even weaker. County business patterns show average annual earnings at only $10,796 ($5.19/hr), compared to $16,469 ($7.92/ hr) for manufacturing. The diffuse structure of the retail sector makes major gains in productivity elusive. Fully 31 percent of the sector's jobs in 1989 were in "eating and drinking" establishments, where productivity is low and where earnings depend greatly on gratuities of a client population that has lower than average income. Earnings reports for El Paso's retail sector probably exaggerate actual wages, since some "Mom and Pop" retailers and eateries rely on unpaid family labor, ignore minimum wage laws, or don't report wages at all. The services sector shares some of retail's anemia, though its average earnings are modestly higher. Three decades of rapidly rising employment in services have included a substantial portion of low-wage jobs. The 1989 County Business Patterns shows that nearly 20 percent of all employment in services, some 12,000 jobs, were in such poorly paid fields as personal services, help supply, home health and child care, janitorial, and domestic services. Annual earnings in these occupations were from 20 percent to 65 percent lower than the county economy's average, indicating both low wages and considerable part-time employment. In the retail and services sectors, a significant percentage of the jobs are part-time and/or held by women. Fringe benefits are fewer than in other sectors and violations of minimum wage regulations are greater (INS, 1992, 40-42). The continued growth of this sector, which shows signs of "over-employment," depends on future patterns of Mexican retail consumption under free trade and on increases in discretionary income in El Paso itself. Long-standing, interacting factors have sustained El Paso's chronic low wages and low productivity. The city itself is at the center of an historically disadvantaged region — northern Mexico, New Mexico and West Texas. This region is not blessed with abundant arable land or water and is far from the major U.S. markets. El Paso's mix of poverty and rapid job growth manifests a concentration of workers in low productivity, labor-intensive industries such as light manufacturing, services and retail sales. This concentration, however, is as much an effect as a cause. In an age of highly mobile capital — or in the case of industries for which capital is less important — firms tend to gravitate to where they will find the labor force they need to compete successfully. Low-wage labor remains the city's comparative advantage. 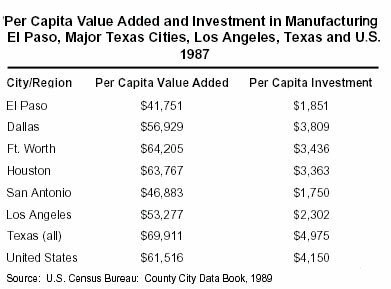 The city's economic planners and business leaders have actively sought new industries by pointing out the area's abundant labor, bargain wages and absence of unions (El Paso Demographic, 1990). Demographic factors play a critical role in El Paso's history of growth without prosperity, explaining the existence of a large, growing and relatively low-skilled labor force characterized by modest wage expectations. One revealing trend is the explosive population growth that caused El Paso's labor force to nearly triple between 1960 and 1990 (see Table l). From 1974 until 1990 the county's labor force grew at an annual average of about 3.4 percent. Population growth for the county during the same period averaged 2.2 percent annually. The U.S. labor force and population grew at about half those rates in the comparable period. Swelling El Paso's labor force was the vast bulge of the area's young persons reaching working age during that period. Because of markedly higher fertility among the Hispanic population, nearly 70 percent of the total population according to the 1990 census, El Paso's birth rate has consistently soared above the U.S. average. 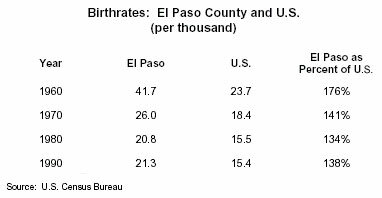 In the 1960s El Paso's birth rate of 41.7 per thousand population was the ninth highest among U.S. urban areas. Although it is falling, El Paso's birth rate remains more than a third higher than the nation's. Fertility — the average number of births per woman — of Texas' Hispanic population hovered around 3.0 throughout the 1980s, 64 percent higher than that of non-Hispanic whites and 17 percent higher than that of African-Americans. While studies have shown that fertility of Hispanic women tends to fall as assimilation occurs, much of the restraint on overall Hispanic fertility is offset by higher fertility among the increasing numbers of Hispanic immigrant newcomers settling in the area (Bouvier, 1993, 11). The large number of children born in the 1950s and 1960s reached working age and swelled the labor force of El Paso in the 1970s and 1980s. The local baby boom slowed but did not stop in the 1970s and 1980s, thus ensuring substantial labor force growth in the 1990s and beyond unless participation rates fall significantly or heavy out-migration occurs. Rapid natural increase in population in El Paso has resulted in a county population whose median age (24.9) in 1990 was significantly lower than the U.S. average (32.7). Also boosting the area's labor force has been rising participation among Mexican and Mexican-American women since the early 1970s. The female participation rate rose from 36.4 percent in 1970 to 49 percent in 1980, and to 53.9 percent in 1990, as family customs changed and employer preferences developed for female workers in certain occupations, such as apparel and electronics. Migration from Mexico is the third demographic ingredient in El Paso's swelling army of would-be workers. The term "migration" is rejected as inapt by some area leaders, who emphasize that the twin cities of El Paso-Ciudad Juarez share common origins, culture and family connections and have economies that are increasingly interlinked. Under these circumstances, the international border separating them is regarded locally by some as "artificial," particularly among those who gain from an oversupply of labor and depressed wages. In a combined two-city urban agglomeration of nearly 1.8 million people, considerable leakage from the low-wage, underemployed Mexican labor force into El Paso's relatively more remunerative labor market is too often regarded as inevitable, or even desirable. Mexican migrants who enter El Paso's labor market fall into three general categories. 1. Legal Immigrants, who qualify for residence under U.S. immigration law through family relationships or possession of needed skills. They have the right to bring their family members. During the 1970s and 1980s legal immigrants settled in El Paso at the rate of about 4,000 to 5,000 a year. Only three percent of them were nationals of countries other than Mexico. One effect of U.S. immigration laws on labor force quality is their emphasis on family connections rather than needed skills as tickets for admission. 2. Illegal, or "Undocumented" Immigrants, who reside and work in El Paso without regard for the immigration laws. Until 1986, when the Immigration Reform and Control Act (IRCA) was passed, there was no effective penalty against illegal immigration. Since the implementation of IRCA, which instituted both employer sanctions and a general amnesty for illegal aliens, U.S. employers have been subject to fines for hiring ineligible aliens. Enforcement of the law, however, has faltered because of the proliferation of false documents and the paucity of Immigration and Naturalization Service (INS) inspectors. Estimates vary as to how many illegal aliens are settled in the El Paso MSA. The IRCA amnesty granted legal status to 18,000 one-time illegals in the metropolitan area who claimed to have resided in the United States since 1982 or earlier. According to 1992 INS estimates, those aliens had in their households an additional seven thousand undocumented persons who did not qualify for legalization (INS, 1992). It was also widely estimated during the legalization process in 1987-1989 that as much as half the national illegal alien population did not apply or was ineligible for the amnesty. By the Census Bureau's own estimates, some five million residents of the United States were missed in the census undercount of 1990, an estimated 1.1 million of them Hispanics, more than half of them illegal aliens. If the distribution of the known Hispanic population is prorated, El Paso's share of the undercount would have been 19,600 in 1990. Moreover, the Census Bureau now estimates that illegal alien settlement has continued since the amnesty at a rate of 200,000 to 300,000 per year nationally (Pear, 1992, 1, A-20). Applying the proportions of El Paso's legalized alien population, which was 1.1 percent of all illegals, suggests an annual illegal settlement in El Paso of about 2,600 yearly. These estimates imply a 1993 stock population of 35,000 to 45,000 illegal aliens in El Paso County. 3) Commuter workers originally meant Mexican citizens with the legal right to work and live in the United States, but who prefer to reside in Mexico and commute to their jobs. Increasingly, the term is applied to all Mexicans who commute to jobs on the U.S. side, whether or not they are legally authorized to work. The unauthorized commuters either slip in across unguarded portions of the border or use visas or other credentials obtained through fraud or misrepresentation. Here again, the numbers of commuters and their impact on the El Paso labor market are difficult to pinpoint. In 1973, the Mexican government estimated 13,000 commuters in the El Paso-Juarez area (Lorey, 1988, 434). Another estimate found that nine percent (or about 10,000) of El Paso's 1973 work force were commuters, representing 20 percent of Juarez's employed labor force (Hansen, 1985, 91). A 1968 study of a sample of 20 firms in El Paso's apparel sector concluded that 40 percent of the sector's 12,000 workers at that time were commuters receiving the same wages as citizens, though their presence was thought to cause wage depression. In a 1970 study, immigration researcher David North estimated that legal and illegal commuters from Mexico constituted up to 11 percent of the labor force in U.S. border counties. North concluded that their probable impact was to displace some agricultural workers and to depress wages in a "loose" labor market (Labor Effects, 1989, 92). The distinctions between "legal" and "illegal" workers are also important in assessing their labor market impact and their contribution to El Paso's low average earnings. Undocumented workers in El Paso are more likely than legal permanent residents to work in the lowest paying jobs in the "secondary sector" of the labor market. Surveys of the amnestied population show that, while in irregular status, 71 percent of foreign workers were likely to have had unskilled or semi-skilled jobs in farming or services, or as operators, fabricators or laborers in industry. By comparison, only 31 percent of U.S. workers were employed in those categories (INS, 1992, 34). Former illegals in Texas, outside of Dallas and Houston, reported a mean family income in 1987 of only $13,408, compared to the U.S. average at that time of $30,853 (INS, 1992, 39). Ten percent of formerly-illegal aliens nationwide reported that they had been denied the minimum wage in their U.S. jobs, and 13 percent said they had been denied legally-required overtime payments. But illegal aliens in Texas were twice as likely to be victims of minimum wage infractions (INS, 1992, 39-40). While the components of the migration stream into the El Paso labor market may be difficult to measure with precision, the overall growth of the foreign born population in the MSA leaves little doubt about the demographic and labor market significance of immigration (see Table 8). Over 40 percent of the MSA's population growth between 1970 and 1990 came from international migration. If current population/labor force ratios are applied, more than 50,000 immigrants joined El Paso's resident labor force in the last two decades, of whom between 95 percent and 97 percent were of Mexican origin. This does not include the presence in the labor market of 20,000 to 30,000 commuter workers. The Mexican migrants to El Paso join a Mexican-American population that is already struggling against educational deficiencies. In the 1990 census, Hispanics over the age of 25 showed a high school completion rate of 49.2 percent in El Paso, compared with 75.2 nationally. The 1990 census also found that 28.5 percent of all El Pasoans speak English poorly or not at all and 23.6 percent have less than nine years of education, nearly two and half times the national percentage (10.4%). Only one-third of the city's foreign-born population is naturalized. Meanwhile, these shifting demographics have helped place El Paso in the vanguard of the nation's cities in most measures of poverty and need. El Paso's poverty rates for individuals (26.8%) and for families (22.4%), are twice the national average. Poverty tends to be deeper, as well, in El Paso: 18.7 percent of the population has incomes that are 25 percent or more beneath the poverty level. The 1990 census showed ten percent of the MSA's population receiving public assistance, compared to 6.7 percent for Texas and 7.5 percent for the nation as a whole. Portrayed here is an El Paso labor force of both foreign and domestic origin marked by conditions that virtually ensure poor competitiveness. Its members tend to be youthful, and therefore inexperienced as workers; increasingly female, and therefore less likely to receive equal pay and training; poorly educated; unionized at less than half the national rate; burdened with poor English language skills; three-quarters minority; and at least one quarter not fully acculturated to U.S. life. El Paso's labor force, moreover, is likely to continue growing through immigration and natural population increase at a rate considerably faster than the nation's. But this current and prospective abundance of labor bars individual workers from commanding better wages and training opportunities and dissuades employers from investing for greater productivity. Also contributing to the area's wage depression and income inequality is "cohort crowding," or the rapid entry into a labor market of a large bulge of young, inexperienced workers (Burtless, 1990, 103). Hopeful of attracting higher value-added industries, El Paso's economic and business leaders find that labor force conditions have created a peculiar economic development treadmill. The existence of a large, needy and inexpensive labor force attracts unstable, declining, non-capital intensive industries. The growth of labor-intensive jobs encourages the continued expansion of the low-skilled labor force through a weak public education system and further immigration. Low earnings mean low tax revenues and low public sector investment that otherwise might yield greater competitiveness. High immigration ensures a rising number of claimants for public assistance and services dollars that might otherwise be invested to improve labor force quality. Ending this wearisome cycle will be difficult. The heavy concentration of Spanish-speakers within El Paso city slows the transition to English and impedes assimilation. That, and the presence just across the river of the "Mother Culture" of the Hispanic population itself lowers the incentives for assimilation. Such high concentrations of Spanish-speakers also make for isolation of English-deficient Mexicans and Mexican Americans in the public school system, with diminished prospects for acculturation and quality education for all. High fertility within Mexico and among Hispanics in El Paso portends a continued heavy flow of new job seekers at least for the next two decades. El Paso schools have been hard pressed to pay for the rapid growth of the school age population. In the 1980 census, 40.7 percent of El Paso's population was between five and 24 years of age, compared to 34 percent of the U.S. population. 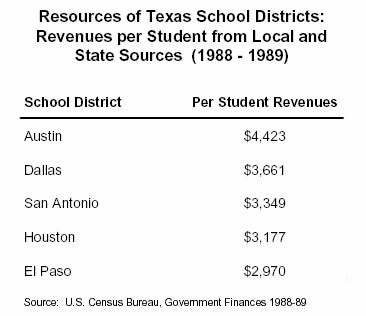 The school system's resources are limited by the city's weak tax base and generally low incomes (see Table 9). The most rewarding step El Paso could take to end the cycle of poor wages and poor jobs would be to improve education and training. Most needed would be early expansion and upgrading of public education (K-12), added technical and adult education facilities, on-the-job and apprenticeship training, and more stress on English language skills. As education and training improve, economic development officials should concentrate on attracting firms that require higher skills by using the incentive of locally-financed training programs. All these needs are generally acknowledged by government and business leaders, but the resources are insufficient and the demands are growing. Current moves at the state level around the country to establish the principle of equal access to resources for all school districts, rich and poor, may ultimately benefit school systems such as El Paso's. Raising the high school completion rate would also keep young people in school longer and slow the growth of the less-skilled segment of the labor force. But immigration and rapid population growth themselves impede the schools' march toward higher quality. Otherwise, El Paso can only do whatever is within its limited powers to slow the increase in the number of low-skilled workers, to make family planning information and assistance available, to encourage capital investment and to improve existing labor standards. While immigration control is a federal responsibility, the city and county authorities should continue to press Washington for additional enforcement resources and for tougher action at the border and within the county against employers of ineligible aliens. In the absence of a major demographic turnaround, El Paso's economy faces a dismal future. The outlook is for further Tercermundización, a Latin American term for decline toward third world standards. In the changing national economy, even declining, labor-intensive industries will be harder to attract. The region's low purchasing power will restrain the growth of jobs in areas of services and retail. And tight budgets dim the prospects for continued rapid growth in government employment. El Paso may find it steadily harder to keep unemployment below double digits and to raise the local tax base adequately to finance public facilities that will attract new and better investment. If free trade with Mexico becomes a reality, Juarez will be increasingly competitive with El Paso for new jobs in sectors such as manufacturing, wholesale and retail. The social and economic profiles of the two cities may well become increasingly alike. Bean, F. D., Frisbie, W. P., Lowell, B. L. & Telles, E. E. 1989. "The Spanish-American Population in the American Southwest." In Mexican and Central American Population and U.S. Immigration Policy, edited by F.D. Bean, J. Schmandt, & S. Weintraub. Austin, TX: Center for Mexican American Studies - University of Texas Press. Bouvier, L.F. & Poston, D.L. 1993. Thirty Million Texans?. Washington, DC: Center for Immigration Studies. Brown, P.G. & Shue, H., eds. 1983. The Border that Joins: Mexican Migrants and U.S. Responsibility. Totowah, NJ: Rowman & Littlefield. Burtless, G. 1990. "Earnings Inequality Over the Business Cycle." In A Future of Lousy Jobs? edited by G. Burtless. Washington: Brookings Institution. City of El Paso. Department of Planning, Research and Development. 1991. County of El Paso Population Profiles from 1990 Census. _____. _____. 1991. City of El Paso Business Barometers. _____. _____. 1990. El Paso Major Employers. _____. _____. 1990. General Demographic and Economic Statistics, City of El Paso. Garcia, M. T. 1981. Desert Immigrants: The Mexicans of El Paso, 1880- 1920. New Haven: Yale University Press. Hansen, N. M. 1985. "The Nature and Significance of Border Development Patterns." In The U.S. and Mexico: Borderland Development and the National Economies, edited by L. J. Gibson & A. C. Renteria. Boulder, CO: Westview. _____. 1981. The Border Economy: Regional Development in the Southwest. Austin: University of Texas Press. Hufbauer, C. G. & Schott, J. J. 1992. North American Free Trade: Issues and Recommendations. Washington: Institute for International Economics. Lorey, D. E., ed. 1988. United States-Mexico Border Statistics since 1900. Los Angeles: UCLA Latin American Center. Martin, P. 1986. Illegal Immigration and the Colonization of the American Labor Market. Washington: Center for Immigration Studies. Mishel, L. & Frankel, D. M. 1991. The State of Working America. Washington: Economic Policy Institute. Peach, J. T. 1985. "Income Distribution in the U.S.-Mexico Border Lands." In The U.S. and Mexico: Borderland Development and the National Economies. Pear, R. December 4, 1992. "New Look at the U.S. in 2050: Bigger, Older and Less White." New York Times. Santiago, A. M. & Wilder, M. G. 1991. "Residential Segregation and Links to Minority Poverty: The Case of Latinos in the United States." Social Problems, 38, 492-515. Suarez-Villa, L. 1985. "Sectoral and Territorial Implications of Industrialization in the U.S.-Mexico Borderlands." In The U.S. and Mexico: Borderlands Development and National Economies. U.S. Bureau of the Census. Census of Population and Housing: 1950, 1960, 1990. Washington: Government Printing Office. _____. County and City Data Book: 1956, 1962, 1967, 1972, 1977, 1983, 1986, 1991. _____. County Business Patterns: U.S. Summary - 1962, 1969, 1979, 1988, 1989: El Paso County, TX - 1962, 1969 1973, 1979, 1983, 1988, 1989. _____. Government Finances (GF-88-4), 1988-89. _____. State and Metropolitan Area Data Book: 1986 and 1991. _____. Statistical Abstract of the United States - 1990. U.S. Council of Economic Advisors. Economic Report of the President, 1990. Washington: Government Printing Office. U.S. Department of Justice, Immigration and Naturalization Service. 1992. Immigration Reform and Control Act: Report on the Legalized Alien Population. Washington: Government Printing Office. U.S. Department of Labor, Bureau of International Labor Affairs. 1989. The Effects of Immigration on the U.S. Economy and Labor Market. Washington: Government Printing Office. _____. Bureau of Labor Statistics. Employment and Earnings. Selected issues between 1973 and 1991. Weintraub, S. 1989. "Implications of Mexican Demographic Developments for the United States." In Mexican and Central American Population and U.S. Immigration Policy, edited by F. D. Bean, J. Schmandt, & S. Weintraub. David Simcox, Director of Migration Demographics, a consulting firm in Louisville, Kentucky, was the former Chairman of the Cneter's Board of Directors. He is the author and editor of U.S. Immigration in the 1980s: Reappraisal and Reform (Westview Press, 1988). Mr. Simcox is a former U.S. State Department official who specialized in border affairs, and is a former resident of El Paso, Texas.